Like any task, there is an easy and a hard way to control atoms and molecules as quantum systems, which are driven by tailored radiation fields. More efficient methods for manipulating quantum systems could help scientists realize the next generation of technology by harnessing atoms and molecules to create small but incredibly powerful devices such as molecular electronics or quantum computers. Of course, controlling quantum systems is as painstaking as it sounds, and requires scientists to discover the ideal radiation field that leads to the desired response from the system. Scientists know that reaching that state of quantum nirvana can be a long and expensive slog, but Princeton University researchers have found that the process might be more straightforward than previously thought. The researchers report in the journal Physical Review A that quantum-control “landscapes” — the path of a system’s response from the initial field to the final desired field — appears to be unexpectedly simple. Although still a mountain of a task, finding a good control radiation field turns out to be very much like climbing a mountain, and scientists need only choose the right path. Like a hiker, a scientist can take a difficult, twisting path that requires frequent stops to evaluate which step to take next. Or, as the Princeton researchers show, they can opt for a straighter trail that cuts directly to the summit. 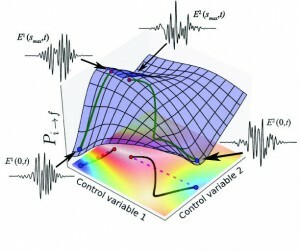 The researchers observe in their paper that these fast tracks toward the desired control field actually exist, and are scattered all over the landscape. They provide an algorithm that scientists can use to identify the starting point of the straight path to their desired quantum field. The existence of nearly straight paths to reach the best quantum control was surprising because the landscapes were assumed to be serpentine, explained first author Arun Nanduri, who received his bachelor’s degree in physics from Princeton in 2013 and is working in the laboratory of Herschel Rabitz, Princeton’s Charles Phelps Smyth ’16 *17 Professor of Chemistry. Following a straighter path could be a far more efficient way of achieving control of atoms and molecules for a host of applications, including manipulating chemical reactions and operating quantum computers, Nanduri said. The source of much scientific excitement, quantum computers would use “qubits” that can be entangled to potentially give them enormous storage and computational capacities far beyond the capabilities of today’s digital computers. If the Princeton research helps scientists quickly and easily find the control fields they need, it could also allow them to carry out improved measurements of quantum systems and design new ones, Nanduri said. The work was funded by the Program in Plasma Science and Technology at Princeton University, the Army Research Office, and the U.S. Department of Energy.